While seeking out recipes for an upcoming class, a pasta with what to me was an unusual combination of broccoli, cauliflower, pancetta, pine nuts and raisins (!) caught my eye. 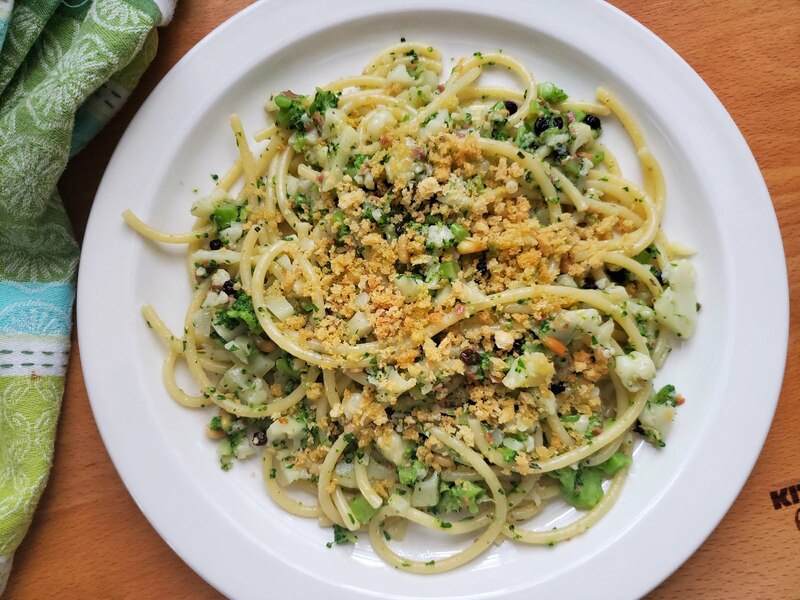 I am always on the lookout for pastas that incorporate seasonal vegetables—particularly those that include combinations of vegetables. 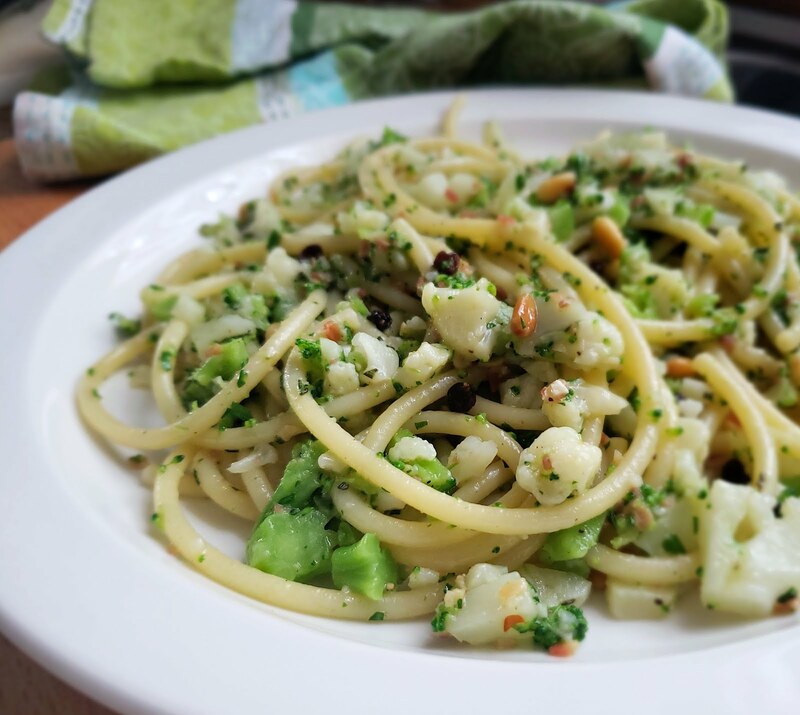 Having pastas like this in my repertoire helps me to use up the inevitable mish mosh of odds and ends of different vegetables that can accumulate in a household of one or two. 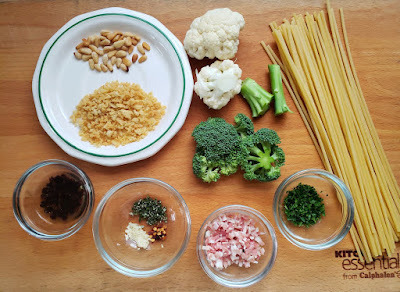 But I have quite a few pastas in my “go to” recipe file that include broccoli and cauliflower. 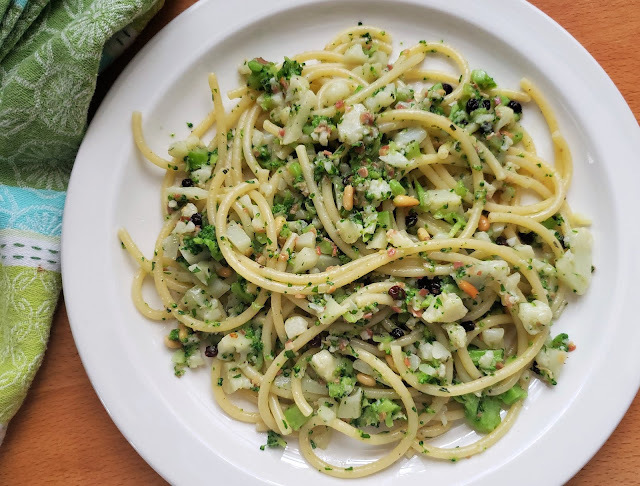 I was mostly intrigued by this recipe because of the inclusion of raisins—something that I often put in a salad...or grain pilaf…with cauliflower or broccoli, but not something I think I have ever put in a pasta with them. Of course, it makes sense that slightly bitter vegetables like broccoli and cauliflower would be enhanced by this combination of pine nuts and raisins. But as I discovered, they should be incorporated with a light hand—truly as an accent and not a main ingredient. That first recipe that caught my eye was completely out of balance. I suspected this was the case as I looked at the list of ingredients, but forged ahead anyway because I trusted the chef who wrote the book. All I can say is that the half cup of raisins called for (in a recipe for 3/4 of a pound of pasta) was overwhelming. I added more pancetta than the recipe called for…and it still wasn’t enough to balance the sweetness of the raisins. But I liked the idea so much that I persisted. I found a much more balanced recipe for this combination of ingredients in Janet Fletcher’s Four Seasons Pasta (a book worth owning if you love pasta) and used it to correct the recipe that originally caught my eye. 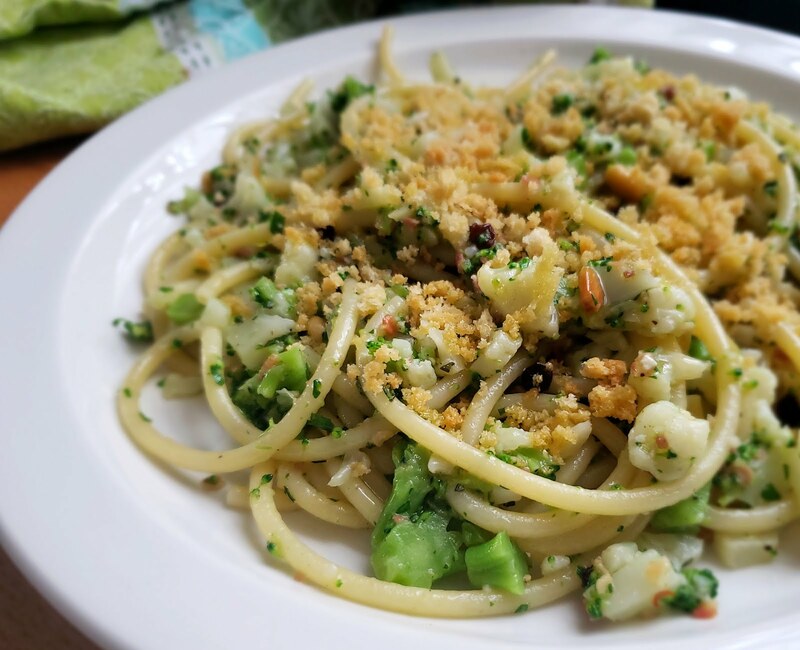 The final recipe is filled with lively flavors and is very satisfying…and a nice change from some of my old broccoli and cauliflower pasta standbys. Bring a large (6 to 8 qt) pot of water to the boil. Salt well. Add the cauliflower and cook until just tender to the tip of a knife (you want it to be soft, but not mushy)—about 5 minutes. Lift out and spread on a towel. While the cauliflower cooks, cut any thick stems away from the florets of the broccoli. Drop these stems in the same water that you used to cook the cauliflower. After three minutes add the florets. Continue to cook until the broccoli is just tender (same texture as the cauliflower). Lift the broccoli out of the pan and add it to the towel with the cauliflower. When the vegetables are cool enough to handle, transfer to a cutting board and roughly chop. 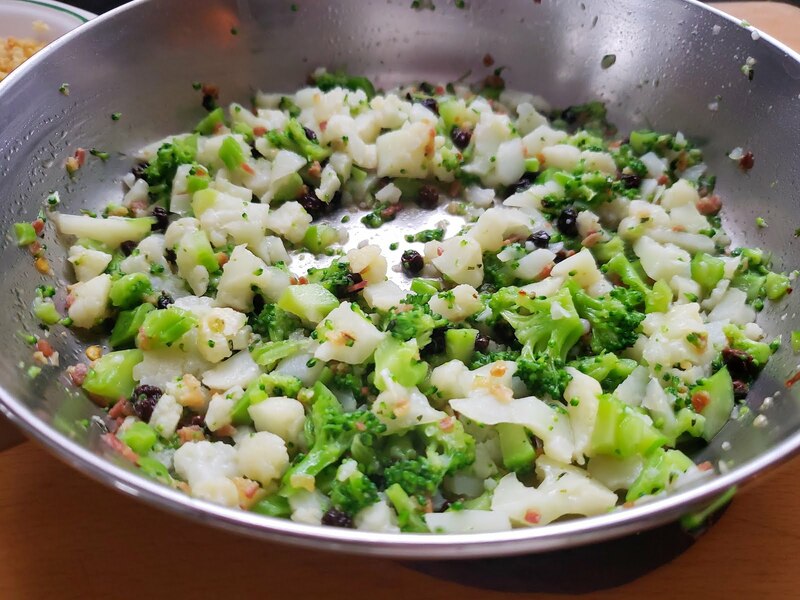 You should have a rough mixture of small and medium pieces of cauliflower and broccoli. While the vegetables cook, make the sauce. Place the currants in small ramekin or custard cup and add enough boiling water so that the currants are just covered with water. (You can just ladle in some of the vegetable cooking water if you like.) Set aside. Place 2 T. of olive oil and the pancetta in a large sauté pan set over medium low heat. Cook, stirring occasionally, until the pancetta is rendered, beginning to crisp and is turning golden brown. Add the garlic, rosemary and hot pepper flakes and cook briefly until fragrant. Remove from the heat and add the currants along with their soaking liquid. Stir and scrape to release any caramelized bits of pancetta from the bottom of the pan. Set aside in a warm spot while you cook the pasta. Cook the past in the same water that you used to cook the vegetables. About 3 or 4 minutes before the pasta is done cooking, return the pan with the pancetta and seasonings to moderate heat and bring to a simmer. Add the cauliflower and broccoli and toss/stir to coat the vegetables with the flavorings. 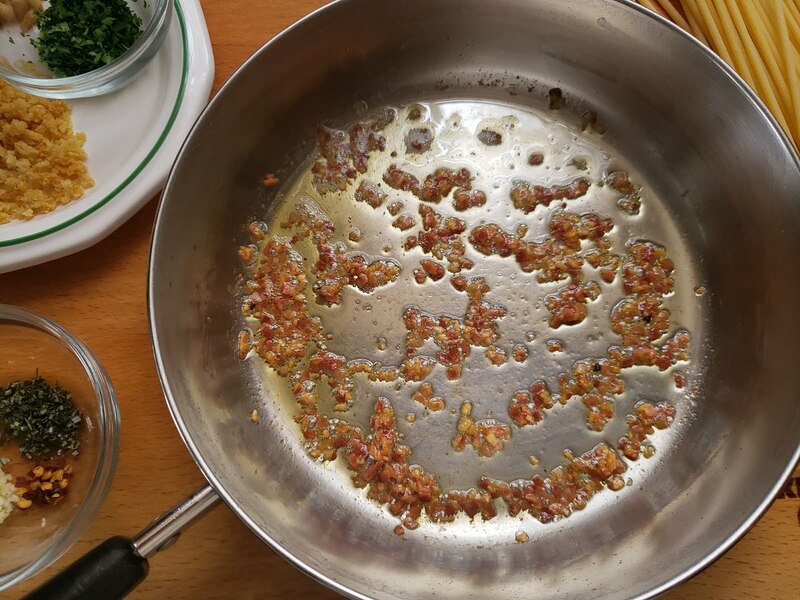 If the pan seems dry, add a small ladle of pasta cooking water to the pan…you definitely don’t want the vegetables to be soupy or soggy, but neither do you want the pan to be so dry that the pancetta/garlic mix is burning or without the fluid means to coat the vegetables. When the vegetables are hot through, reduce the heat to the lowest setting to keep the “sauce” warm while the pasta finishes cooking. When the pasta is al dente, drain well, reserving some of the pasta water. Add the pasta to the pan with the sauce. If the sauté pan is not large enough to hold the sauce and pasta, return the pasta to the pot it was cooked in and scrape in the sauce. (Add a splash of pasta water to the sauté pan and swirl it around to get all of the sauce and add it to the pot). Add the butter (if using), the pine nuts and parsley and toss/stir until the butter is melted and the noodles are coated with a light fluid sauce and all the flavorful bits. If the pasta seems dry or tight, add some of the pasta water (again, just enough to help the flavorings coat everything in a light fluid sauce—the liquid shouldn’t be pooling in the pan). If you like, add a good drizzle of olive oil. Toss again. Taste and correct the seasoning. Divide the pasta among 4 to 6 plates and scatter the toasted breadcrumbs generously over each serving. Drizzle with more olive oil and serve. This dish can be made with all cauliflower or all broccoli…or some of each in proportions that please you. You will need 1 1/4 lb. combined weight of the two. I prefer a slightly larger quantity of cauliflower (which is why I have called for 3/4 lb of cauliflower and only 1/2 lb. of broccoli). Leave the cauliflower in very large florets (about 1 1/2 to 2 inches across) so they will cook uniformly without becoming mushy. 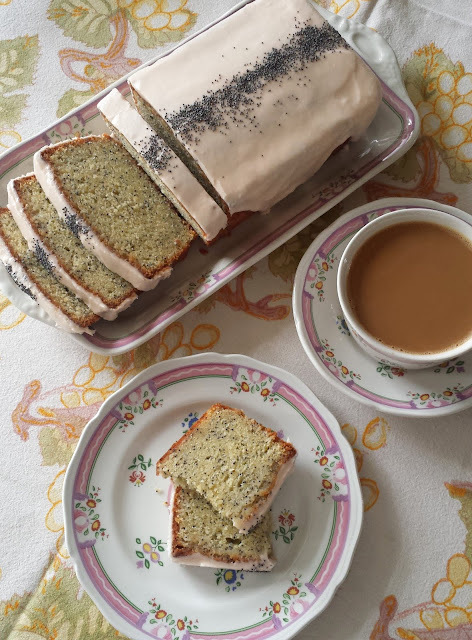 The recipe directs you to cut the broccoli stems away from the florets because the florets will cook very quickly and the stems will take longer. Adding the florets for just a minute or two—after the stems have been cooking for a few moments—will prevent them from becoming soggy. To make toasted breadcrumbs, cut the crusts off of some day old/slightly stale bread (choose a substantial loaf of some kind—like French farmhouse…or a good baguette) and process in the food processor to form coarse crumbs. Spread the crumbs in a small baking dish and drizzle with a little olive oil. Place in a 375° to 400° oven and bake, stirring occasionally, until golden brown—about 5 to 10 minutes. Toasted breadcrumbs may be frozen. To use, just scoop out what you need and set in a warm place to thaw (or re-toast briefly in a hot oven).